Atlanto axial joint anatomy considers a most vital joint in the neck. Atlanto axial joint anatomy considers a most vital joint in the neck; it's a major cause of headaches when malfunctioning. This page provides information on an area that is hugely important in the treatment of headaches, dizziness and severe neck pain. Firstly, I'm going to start with an anecdote; they have no scientific value whatsoever, but do sometimes serve to illustrate a point. They can also be very misleading; treat them with a pinch of salt. I have just finished doing a locum in Europe; the return journey was torrid, beginning in Birmingham, United Kingdom, on Saturday morning. Three flights later I reached home on Sunday evening. Sleeping on an modern day jet is just about the worst thing you can do for your neck. There was nothing to report for a few days, but I then began to get vague discomfort in the upper neck; by nine o'clock this morning I had a blinding headache. I even felt slightly nauseous. 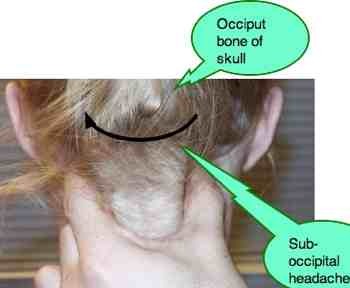 Even chiropractors need a DC; on motion palpation she found a suboccipital fixation. The adjustment of C1 was simple yet profound; within thirty minutes the headache started to lift. That was three hours ago; as I write I have virutually no pain. Just a washed out feeling persists; what I need is an early night. The atlas is the first bone in the neck. It is quite unlike any othe in the body; it's simply a ring, with facets above and below which articulate with its nearest neighbours, namely the occiput of the skull and the axis. The axis, too, is quite unique. It is not unlike the other neck vertebrae, except that it has a peg called the dens jutting straight upwards. The atlas rotates on this dens, giving the neck about 50 percent of its rotation. The Japanese call the axis the Little Buddha. Without too much imagination, you can see why. "Greetings from Winnipeg, Canada. Whilst surfing the web I found your website; it's very informative. Congratulations." The spinal cord, perhaps the most sensitive tissue in the body, passes down through the atlas and axis, carrying vital information to and from the body. Because of this intimate relationship, subluxations have a profoundly negative effect on the body. Motor accidents almost invariably leave their mark on the cervical spine anatomy; hence today there is much whiplash research being done into injuries to the atlanto axial joint anatomy and allied areas of the neck. The rules are simple; belt up, don't drink and drive, travel more slowly, obey the laws of the road and take a break every couple hours. The consequences of doing your own thing when behind the wheel are too ghastly to contemplate. Death, life long pain and disability are not uncommon. Don't you too have family and friends who have been thus affected? There is no disc between the atlas and the axis. Thus the facet joints and numerous ligaments, of course, provide the only stability between the two bones; fixation and subluxation occurs readily. 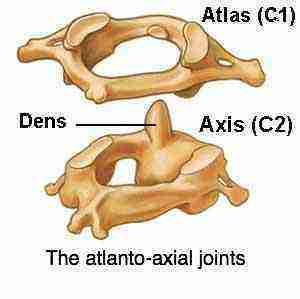 Early chiropractors, known for a reason that escapes me, as hole in one practitioners adjusted only the atlas. If you consulted him or her with low back pain, only C1 would be adjusted. Newer findings confirm that there is an intimate relationship between the atlas and L5, the vertebra that is the most common cause of low back pain. Read more about the effect whiplash research may have on your choice of treatment for your neck pain. WHIPLASH RESEARCH ... the statistics are frightening. Small joints in the neck in general and the atlanto axial joint anatomy specifically control the movements of the vertebrae; a malfunction causes the cervical facet syndrome. This nerve emerges between the atlas and the axis, and supplies the base of the skull, the so called occipital region. Irritation of the greater occipital nerve is probably the most frequent cause of headaches located at the top of the neck, especially the atlanto axial joint anatomy. It's an area that chiropractors specialise in. Just how safe is manipulation of the upper neck; are there dangers? Could you have a stroke? Adjusting the atlanto axial joint is one of the areas where chiropractic help takes infinite pains to minimise injuries. There simple answer is yes, there are dangers. Having said that, the chances of you having a stroke chiropractic episode are so slight that you can to all intents ignore it. Depending on which research you read, about 1 per 6 million manipulations will cause a serious injury. I have given probably two hundred thousand cervical manipulations in my career without a serious mishap. Yet they do happen, and the wise chiropractor adjusts the upper neck warily knowing well that's where angels fear to tread. Part of the solution is to be particularly wary with the patient suffering from dizziness or vertigo; yet the irony is that some of these folk only get relief from an adjustment of the neck. The vertebral artery passes up through the atlanto axial joint anatomy to the balance area of the brain. It too can be affected by upper cervical subluxations. Nevertheless, research shows that seventy percent of vertigo is caused by loose crystals in the inner ear; neither drugs nor the chiropractic adjustment should be used in the first instance. The warning sign is a positive hallpark dix test; avoid adjusting that patient and the chances of stroke are even more remote. Have you ever seen the kidney Olympics on television? You'll quickly realise the dangers of swallowing bucket loads of pills for your headaches is far more dangerous. Most of those young people lost their kidneys and are on dialysis through taking analgesic medication. 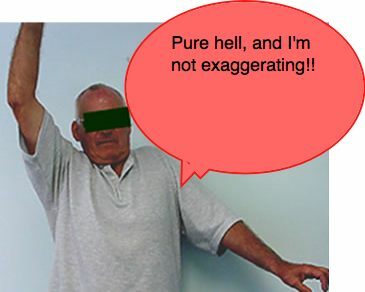 In thirty four years of chiropractic, not one of my patients has, touch wood, had a stroke. One elderly lady had a temporary ischemic attack a week after treatment; it was almost certainly unrelated, and in any event recovered completely, and still consults me once a month. I do tread warily when approaching her neck, naturally. See lower down more about the potential dangers of stroke chiropractic and particularly dual anti inflammatory drugs. An occasional, regular cervical massage has much merit for the dizzy patient suffering from chronic upper cervical pain and headache. The atlanto axial joint anatomy, the jaw joint and the sinuses are intimately interconnected. The sensory nucleus of the nerve that supplies the jaw joint and sinuses, the largest of the cranial nerves is located in the upper neck. Very frequently folk with popping, grating, painful jaw joints, also suffer from upper cervical pain, migraine and severe facial pain. Many sufferers from chronic sinusitis also will tell you that they have upper cervical neck pain. There is anecdotal evidence incidentally that chewing the wax cappings from a local beekeeper may help sinusitis. Studies show bees don’t just bring flower pollen back to the hive but also tree and grass pollens thought to be the main cause of chronic sinusitis. A regular inoculation of these pollens may help your sinusitis. It's for this reason that some beekeepers are now specialising in raw honey that is unheated, and only lightly filtered so that it also contains pollen granules and small wax particles. Notice how the spinal trigeminal tract marked in italics below caries information from the jaw joint to the sensory nucleus of the trigeminal nerve which is actually located in the neck and not in the brain. 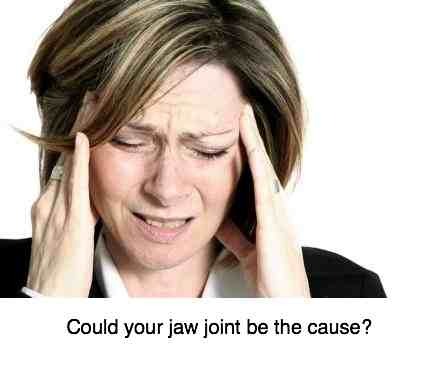 You feel jaw pain in the neck, odd as that may seem. Don't underestimate the influence of diet on your neck pain. 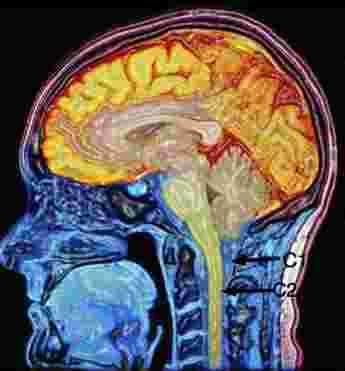 Firstly, 60% of the brain itself is made of fat, half of which is based on the omega-3 fatty acids. The fats found abundantly in fish, flaxseed and walnuts, and to a lesser extent pecan nuts. Secondly there is heaps of research showing that the omega-3 fats have a vital role to play in the management of arthritis in general, and in this instance, arthritis in the neck. Thirdly, all nerves are coated in a fatty myelin sheath that is predominantly oleic acid, the fat found abundantly in olives and avocados. A long, long time? That could well be part of the cause of your neck pain, even a large part, and it would be generally beneficial to your overall to include more omega 3 foods that have an overall anti inflammatory effect on the whole body, and not just your joints. One of the rules in my health philosophy is to first try the simple thing, before treatment that has potential dangers as well as benefits. The benefits of massage therapy include very few if any misadventures if sensibly applied. An occasional, but regular massage will do wonders for your neck pain. If you have cervical pain, and massage doesn't help, then consult a chiropractor for an examination to see if your pain is being caused by a subluxation in your neck. If that doesn't help, only then consider taking drugs. If you enjoy reading in bed at night, as I do, make sure you have bedside lights that are above and between your pillows; the light, preferably from a 3 watt LED globe, should stream over your shoulder. Craning your neck to read by a bedside light has a very deleterious affect on the atlanto axial joint anatomy which must be twisted to accommodate the posture for long periods. Only buy LED light bulbs for your home; they use a fraction of the electricity and last much longer. There are particularly bright ones for directing light onto your book for example, and in the kitchen. Then there are soft LEDs for the lounge where ambiance may be more important. Hiccuping babies. Why do we hiccup ..?